The Dallas Cowboys and Minnesota Vikings, champions of their respective divisions with identical 11-3 records, met in a Christmas Day NFC Divisional Playoff game on December 25, 1971. The Cowboys had gotten off to a slow start and were 4-3 at midseason, but Head Coach Tom Landry’s team won seven straight games to close out the regular season and top the NFC East once the ongoing quarterback controversy between Roger Staubach (pictured at right) and Craig Morton was resolved in Staubach’s favor. RB Duane Thomas led a good group of backs and WR Lance Alworth, obtained from the Chargers, proved to be a valuable addition to the passing game across from WR Bob Hayes. The defense was outstanding from front to back and contained Pro Bowlers in DT Bob Lilly, LB Chuck Howley, CB Mel Renfro, and SS Cornell Green. Minnesota, coached by Bud Grant, had a superb defense, starting with the line anchored by DE Carl Eller and DT Alan Page. The stodgy offense was another story. QB Gary Cuozzo did not provide the necessary spark, Norm Snead, obtained from the Eagles the previous offseason, did little, and now it was Bob Lee, also the punter, behind center. WR Bob Grim was selected to the Pro Bowl, and the running backs were dependable but unspectacular. The Vikings had easily topped the NFC Central Division. There were 49,100 fans in attendance at Metropolitan Stadium in Bloomington, Minnesota on a 30-degree day with a light rain falling. The Cowboys started out conservatively while Minnesota came out throwing on offense. Early in the first quarter, Dallas got the first break when DE Larry Cole forced HB Dave Osborn to lose the ball at his own 36 and DT Jethro Pugh recovered for the Cowboys. After reaching the Minnesota 19, with the key play a third down pass from Roger Staubach to Bob Hayes for 18 yards after a penalty had backed Dallas up, and following an Alan Page sack of Staubach for a five-yard loss, Mike Clark kicked a 26-yard field goal. A promising series for the Vikings that started at the Dallas 48 ended with a 27-yard Fred Cox field goal after a third-down pass to RB Jim Lindsey, in which the receiver nearly made a shoestring catch that would have been good for a first down inside the ten, was ruled incomplete. 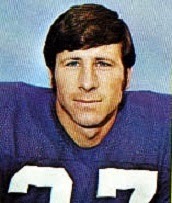 In the second quarter, the Vikings came through with a big play when Lee threw to Bob Grim (pictured at left) for a 49-yard gain in a third down situation to the Dallas 29. However, Chuck Howley intercepted another Lee pass, returning it to the Minnesota 37 to set up a 44-yard Clark field goal that barely made it over the crossbar. HB Clint Jones returned the ensuing kickoff 61 yards, nearly going the distance but being stopped by Mel Renfro. The Vikings came up empty when three incomplete passes were followed by a Cox field goal attempt from 42 yards that was unsuccessful. The score remained 6-3 in favor of Dallas at the half. The Cowboys took control in the third quarter. 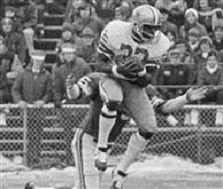 On the third play, an interception by FS Cliff Harris (pictured below) at the Minnesota 43 was returned 30 yards to the 13 and that set up a touchdown carry on the next play by Duane Thomas. Clark added the extra point to put the visitors ahead by ten points. CB Charlie West returned the next kickoff 51 yards to give the Vikings good starting field position at the Dallas 42, with Renfro once again making the stop. However, Minnesota was unable to gain much ground and a field goal attempt by Cox from 46 yards hit the right upright and was no good. Later in the period, the Cowboys put together a 52-yard series following a 24-yard punt return by DB Charlie Waters. Staubach threw to Lance Alworth for 30 yards on a third-and-15 play and then, scrambling to avoid the strong pass rush, he connected with Hayes for a nine-yard TD and, with Clark again converting, the Cowboys led by an insurmountable 20-3 margin. 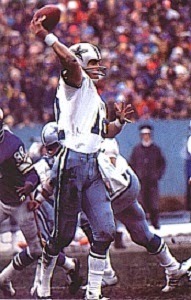 Early in the fourth quarter, the Vikings scored when Page sacked Staubach in the end zone for a safety. At that point Gary Cuozzo replaced Lee at quarterback, and on the next series he completed passes to WR Gene Washington and TE Stu Voigt to get the Vikings to the Dallas 19. But a throw to Grim passed through the receiver’s hands and MLB Lee Roy Jordan intercepted to blunt the threat. Late in the game, the Vikings mounted a drive that concluded with Cuozzo throwing to Voigt for a six-yard touchdown, but there were barely more than two minutes remaining to play and the outcome had long since been decided. The Cowboys came away winners by a final score of 20-12. The Vikings significantly outgained Dallas (311 yards to 183) and had more first downs (17 to 10). However, Minnesota also turned the ball over five times, to none by the Cowboys, and that was the difference in the outcome. 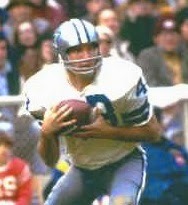 Roger Staubach was efficient as he completed 10 of 14 passes for 99 yards and a touchdown with no interceptions. Duane Thomas rushed for 66 yards on 21 carries that included a TD. Bob Hayes (pictured at left) had three catches for 31 yards and a touchdown and Lance Alworth gained 33 yards on his two receptions. For the Vikings, Bob Lee was successful on only 7 of 16 throws for 86 yards and no TDs while giving up two interceptions. Gary Cuozzo went 12-of-22 for 124 yards and a touchdown but also was picked off twice. Gene Washington caught 5 passes for 70 yards and Bob Grim gained 74 yards on his four receptions while Stu Voigt contributed four catches for 46 yards and the team’s only TD. Clint Jones gained 52 yards on 15 rushing attempts. Dallas went on to defeat the 49ers in the NFC Championship game and then Miami in Super Bowl VI. The Vikings, who sought to resolve their quarterback issue by swinging a deal with the Giants to bring Fran Tarkenton back to the team that he began his pro career with, dropped to 7-7 and placed third in the NFC Central. They rebounded in 1973 to beat the Cowboys for the NFC Championship, losing the Super Bowl to the Dolphins.